I’ve been ranting about how expensive mobile calls and data rates have been for years…. Going back to India, highlighted just how crazy the price gap is. 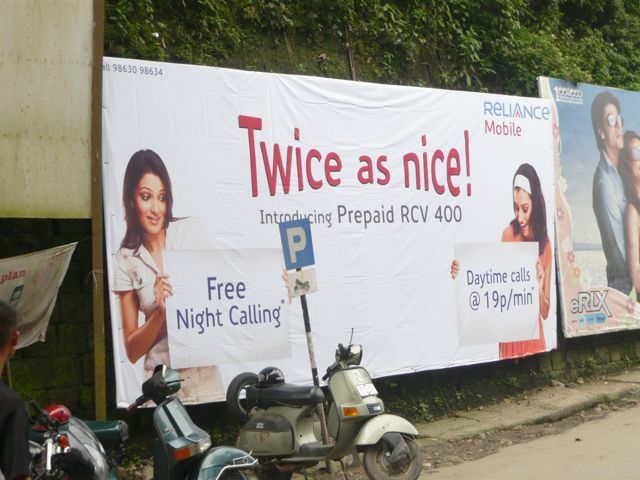 I was in Mizoram, which has only had mobile phones for about 18 months and they have super cheap rates! I’ve taken data from Airtel’s website and tried to extract info from vodafone. Broadband pricing is slowly coming into line. Its time to get Mobile prices inline with the rest of the world. The impact of lower mobile prices was a wider effect to the economy. More New Zealanders would benefit to lower mobile prices than wold benefit by broadband. It will help development and innovation in the mobile space, thus creating jobs and growth opportunities for NZ companies. The future of computing is mobile, its time we grew up and get with the rest of the world! This entry was posted on Tuesday, October 30th, 2007 at 2:56 pm	and is filed under Business, New Zealand. You can follow any responses to this entry through the RSS 2.0 feed. You can leave a response, or trackback from your own site. I’m not sure if such direct comparison is valid – average income in india is much much lower than in NZ, plus amount of subscribers there scales the business to a level unseen elsewhere. Yeah, I know. I was in India when they were selling 100K mobiles a month just in Bombay. I was just in a state that has had mobile coverage for only 18 months and less than a million people. Their prices are higher than rest of India, but still lower by miles than NZ. My problem is that NZ’s pricing is higher other countries and its killing the development of the mobile platform in NZ. We have a low number of mobile services compared with other countries. We still don’t have anywhere near the range of services that were available in India in 2002. We have a problem of “3rd world broadband” (which is being fixed. We have a worse problem of “3rd world mobile services and prices. Its a rant, I know. I just annoyed that nothing is happening ….